This lavishly illustrated book explores the impact of the First and Second World Wars on the city of Glasgow, its people and its industries. 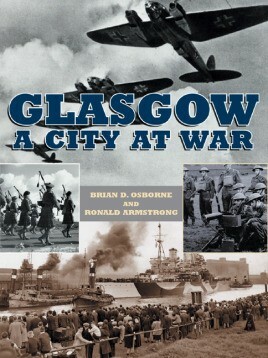 The citizens of Glasgow were affected by war in a variety of ways: the topics covered are wide ranging and include the role of Volunteer Defence Forces and the Home Guard; changing patterns of employment, especially for women, in factories, munitions and nursing; the fear and devastation caused by air raids and the experience of evacuation; and of course the courage and sacrifice of Glasgow's servicemen and women in the Army, Air Force and Navy. There is also extensive coverage of how war shaped Glasgow's industries, in particular the importance of warship building in the Clyde shipyards, and the large-scale manufacture of artillery and munitions. Wartime also brought many new people to Glasgow: servicemen and women from occupied Europe and from across the Atlantic, as well as visiting politicians and royalty. Some of these special visits are illustrated, as are the great victory parades where thousands came together to celebrate that war was finally over. The authors have drawn on a wide variety of sources in writing this fascinating and moving book, but it is perhaps the period photographs which will impress the reader most. Many have never been published before, and they tell the story of Glasgow at war most vividly and powerfully.